Helsinki Dub Club has a solid focus on the sound systems themselves. For this session we have invited Seafront Sound System from Tallinn, Estonia. This sound system with Strictly dub Records Simon Chaozlevel as its founder is sure to bring the dub vibe to this session; with exclusive dubplates, unreleased tunes and their new sound system brought to you from across the sea! This is a celebration of sound system culture in it’s purest form; two sounds playing on their own custom built sound systems. Music selections vary from roots reggae to dub and steppa, not forgetting dubplates and exclusives! The discount codes are valid in the time period or until sold out, only a limited amount is sold! Jan Steadyrocka and Simon Chaozlevel began building the soundsystem in autumn of 2015. Now the system is ready to bring the friend's favorite music; expect back to back selection of Rocksteady, Roots & Dub, Digital, Rub A Dub - basically a journey through from the old to the new. Alongside Jan & Simon, we’ll have Saint-Petersburg rub-a-dub warrior Puffnutty; who's rough & tough flow is already known by the Estonian public. Puffnutty follows the style of those like Burro Banton and Supercat – big names of the 80’s soundsystem scene. “The name of the crew should correspond with the theme which is close to the heart of Tallinn people.” – that was the idea; so please welcome, Seafront Hi-Fi live and direct! Working with the Strictly dub Records label, Seafront has collected a truly unique collection of vinyl and specials. 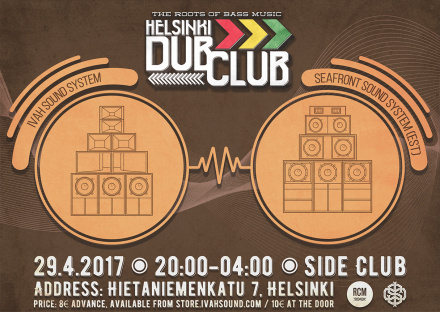 Expect nothing less than the best when the Tallinn based crew string up their sound for the first time in Helsinki; strictly dub! Ivah Sound is one of Finland’s most forward thinking sound systems; playing the best of roots, dub and bass music on their own custom built sound. The Ivah Sound System is specially designed for the music they love. Bass heavy with a punchy kick, crisp mids & highs. This crew of seven always work hard to give the massive an enlightened experience; with microphone chanting, effects and skilled mixing. Ivah Sound is always all about upliftment and bringing cultures together under their mighty stack of speakers. Come and experience the uplifting sound system culture from Tallinn and Helsinki at its finest. A night full of peace, love and unity for all the reggae, dub & and bass music massives!